After a sugar coated promo from the Microsoft, it’s time to put their claims into a test and find out, how good or bad Internet Explorer 10 really is when it comes to gaming and HTML5 performance. Thankfully, a game developer from Scirra.com did a bunch of tests and let me tell you, the results are pretty ugly. Why? Mostdly due to no WebGL support. 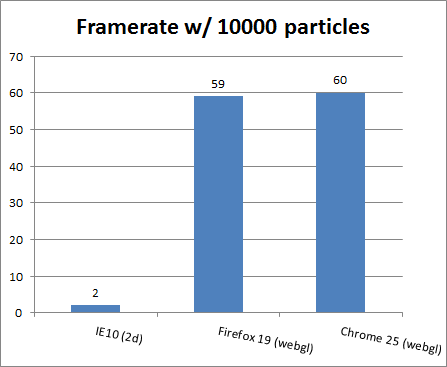 Not only that but as explained in the blog post, IE10 “does not support the free Vorbis audio codec, either in Ogg or a WebM container”, which might annoy some of the evangelists. 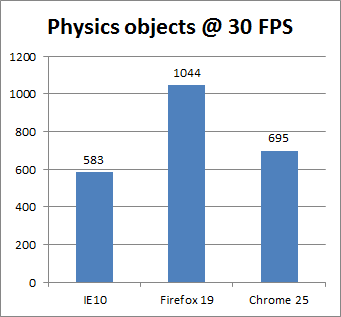 In conclusion, Internet Explorer 10 seems to be falling behind and while it’s still capable of some cool games (thanks to GPU acceleration), there is no denying that other web browsers crush it when it comes to benchmarks like that. V, you got FF number wrong in title. Graphs show FF19. And pls add info about those benchmarks being run on Win8. 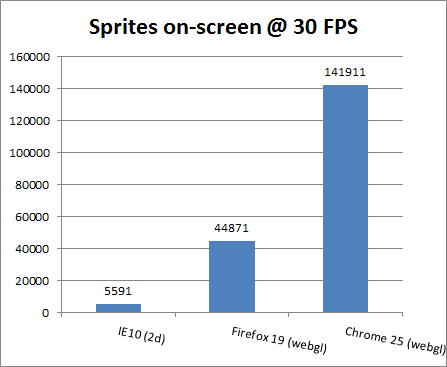 On Win7 with IE 10 PP results may be a bit different. I am sad Opera wasn’t in the test. I know it doesn’t have great HW acceleration but I just like it to be included with the big boys. It deserves it. You compared Chinese and Britons. 3D games NEED 3D acceleration you know…. Of course you can claim that 2D is just perfectly fine for 3D games. (First 3D games used only CPU!) But level of detail on screen that is provided by current titles CAN NOT be served to gamer without FULL NATIVE 3D acceleration.